George and Amal Clooney are now parents of twins! The couple welcomed Ella and Alexander on Tuesday morning. According to the Associated Press, "both children, born at a hospital in London, are 'happy, healthy and doing fine.' George is sedated and should recover in a few days." 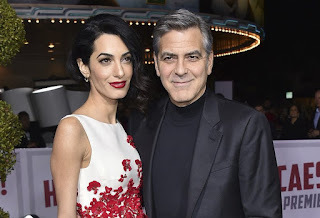 Clooney, 56, and lawyer Amal Alamuddin, 39, married in 2014 in a lavish ceremony in Italy. These are the first children for both. The couple had been living in London awaiting the birth of their babies.